Graduate of Medical University of Warsaw, the Faculty of Medicine with the Division of Dentistry. Zofia Dudkiewicz started her medical practice in the Maxillofacial Surgery Clinic in the Dental Institute of the Medical University in Warsaw. 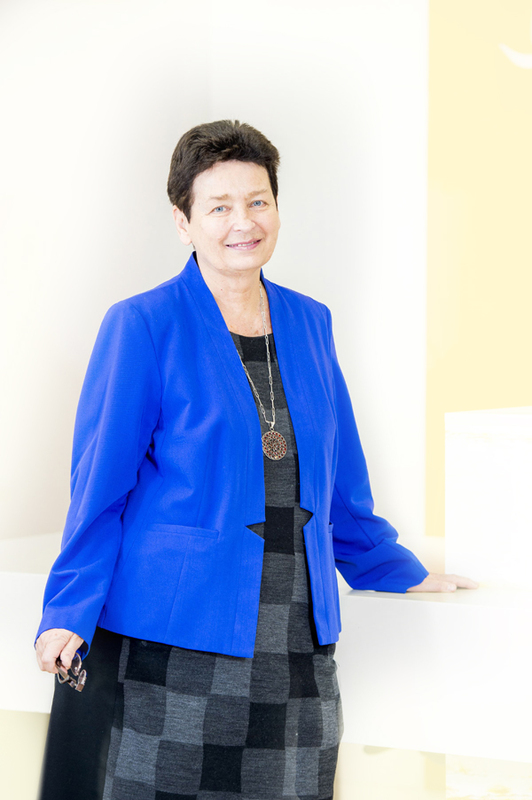 Since 1971 she has worked in the Pediatric Surgery Clinic in the Institute of Mother and Child in Warsaw. Since 1998 she has been the head of the Center for Craniofacial Defects and Endoscopic Surgery and since 1999 the head of the Pediatric Surgery Clinic. Since 1973 she has been a member of the Polish Association of Pediatric Surgeons (between 1992 and 2000 she was acting as the president of the Section of the Plastic Surgery of the Association). Since 1987 she has been a member of the Polish Society of Plastic, Reconstructive and Aesthetic Surgery, and since 1988 she has been a member of the European organization Eurocran (European Collaboration on Cranial Facial Anomalies). 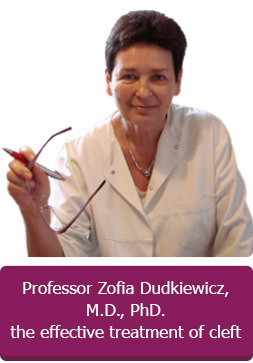 Zofia Dudkiewicz is a member of the Commission of Congenital Developmental Disorders of The Committee on Human Development of the Polish Academy of Sciences and she is also a member of the editorial board of the „Developmental Period Medicine” scientific journal. She has completed a number of internships and visits in children’s, maxillofacial and plastic surgery clinics in Germany, USA, Switzerland and Mexico, headed by professors: Rhebain, Kriens, Schärli and Monasterio. She has developed a concept of early age one stage operations of removing the congenital defects in children which shorten the duration of the treatment and the number of procedures. 1/ CRANIOFACIAL MORPHOLOGICAL OUTCOME FOLLOWING TREATMENT WITH THREE DIFFERENT SURGICAL PROTOCOLS FOR COMPLETE UNILATERAL CLEFT LIP AND PALATE: A PREMILINARY STUDY. J. Oral & Maxillofacial Surgery 2010; 39;122-128. 3/ NASOLABIAL ESTHETICS IN CHILDREN WITH COMPLETE UNILATERAL CLEFT LIP AND PALATE AFTER 1- VERSUS 3-STAGE TREATMENT PROTOCOLS. Oral Max Surg. 2009; 67:1661-1666. 4/ COMPARISON OF DENTAL ARCH RELATIONSHIP IN CHILDREN WITH UNILATERAL CLEFT LIP AND PALATE FOLLOWING WARSAW (ONE-STAGE SIMULTANEOUS REPAIR) AND OSLO PROTOCOLS. Cleft Palate-Craniofac. J. 2009; 46: 648-653. 5/ RELATION BETWEEN THE CONCENTRATION OF ZINC IN MATERNAL WHOLE BLOOD AND THE RISK OF AN INFANT BEING BORN WITH AN OROFACIAL CLEFT. 6/ TREATMENT OUTCOME AFTER ONE-STAGE REPAIR IN CHILDREN WITH COMPLETE UNILATERAL CLEFT LIP AND PALATE ASSESSED WITH THE GOSLON YARDSTICK. Cleft Palate-Craniofac. J. 2009; 46:374-380. 7/SURGICAL CORRECTION OF MIDFACE DEFICIENCY IN CLEFT PATIENTS. 8/ LONG-TERN SKELETAL STABILITY AFTER MANDIBULAR DISTRACTION. 9/ MIDFACIAL GROWTH IN A CONSECUTIVE SERIES OF PREADOLESCENT CHILDREN WITH COMPLETE UNILATERAL CLEFT LIP AND PALATE FOLLOWING A ONE-STAGE SIMULTANEOUS REPAIR. Cleft Palate-Craniofacial Journal, November 2008, Vol. 45 No 6, 667-673. European Journal of Orthodontics 2003; 25,4,/32/,433. 11/NEW APPROACH TO TREATMENT OF PIERRE – ROBIN SEQUENCE. Medical Science 2000, Vol. 6 , Supp. 4 . 52. 12/UNIQUE METHOD OF TREATMENT OF THE ROBIN SEQUENCE. New Medicine, 1/2001, vol. 4, 36-38. Departmentof Paediatric and Adolescent Surgery, National Research Institute for Mother and Child, Warsaw, Poland. Centre for Craniofacial Disorders. 13/ NINETEEN YEARS OF CLINICAL EXPERIENCE IN EARLY ONE – STAGE REPAIR OF UCLP. Medical Science 2000, Vol.6, Suppl. 4 , 52. 14/ GASTROESOPHAGEAL REFLUX IN THE PIERRE ROBIN SEQUENCE. EARLY SURGICAL TREATMENT. The Cleft Palate – Craniofacial Journal 2000, Vol. 37, N 2, 205-208.